The rain was pouring down, and the road to the Canossa Spirituality Center was a muddy, slippery mess. 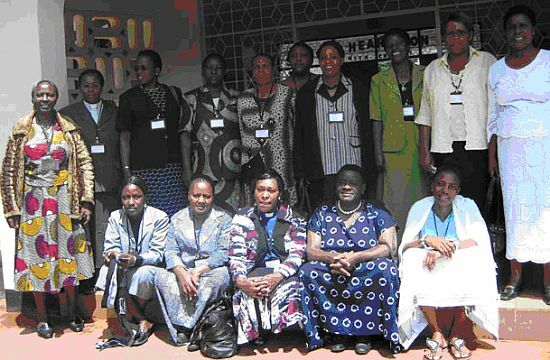 But this didnt stop 20 women from Tanzania and Kenya from gathering in Arusha, 7-12 April, for the first LUCCEA consultation for women theologians. The Lutheran Communion in Central and Eastern Africa (LUCCEA) includes ten churches in eight countries, with nine of the churches being members of the LWF. Administrative support and coordination are provided through an office in Nairobi, Kenya. In addition to the Evangelical Lutheran Church in Tanzania (ELCT), LUCCEA churches include: Kenya Evangelical Lutheran Church (KELC), the Evangelical Lutheran Church of Kenya (ELCK), Ethiopian Evangelical Church Mekane Yesus, The Evangelical Lutheran Church in the Democratic Republic of Congo, The Evangelical Lutheran Church of Eritrea, and Malagasy Lutheran Church. He described the purpose for the consultation as three fold: First of all it was an opportunity for the participants to encourage one another in carrying out their responsibility; to build up each other and even to appraise each others performance in order to see how we can move forward. In conclusion he assured the participants saying that their work is quite significant, and he encouraged the formation of a network for sharing experiences and learning from one another. Although the ELCT has supported the ordination of women for 20 years, more than one speaker expressed disappointment that not all dioceses of the ELCT allow women to be ordained to become pastors. There are some positive signs, however. The Diocese East of Lake Victoria is poised to ordain its first women as pastors in 2011. The Tanzanian church has over 2,000 male clergy but only 116 female pastors. The number of ordained women in other LUCCEA churches is also low. For example, the Kenya Evangelical Lutheran Church has only three ordained women serving in the church. Consultation participants expressed concern about the decreasing number of women entering theological education. Another speaker was Dr. Kahakwa, Professor of Systematic Theology and Missiology at Makumira University College. He presented a paper entitled, A Divided Church in a Divided World: Church Divisive Issues. He stressed that the Church is called upon to preach unity and not division; to build bridges and not walls, and he called the ordination of women a bridge. During the consultation a panel of women gave reports of their experiences as pastors and leaders in their churches. One of these speakers was The Rev. Alice Kabugumila. Pastor Kabugumila was the first woman to attend Makumira Lutheran Theological Seminary in 1969 in order to study theology. Support for her studies was provided by the Moravian Church. She had to wait over 30 years before her diocese agreed to her ordination. She now serves on the staff of the Northwestern Diocese ELCT. Participants were given the opportunity to respond to these reports and to add their own experiences.